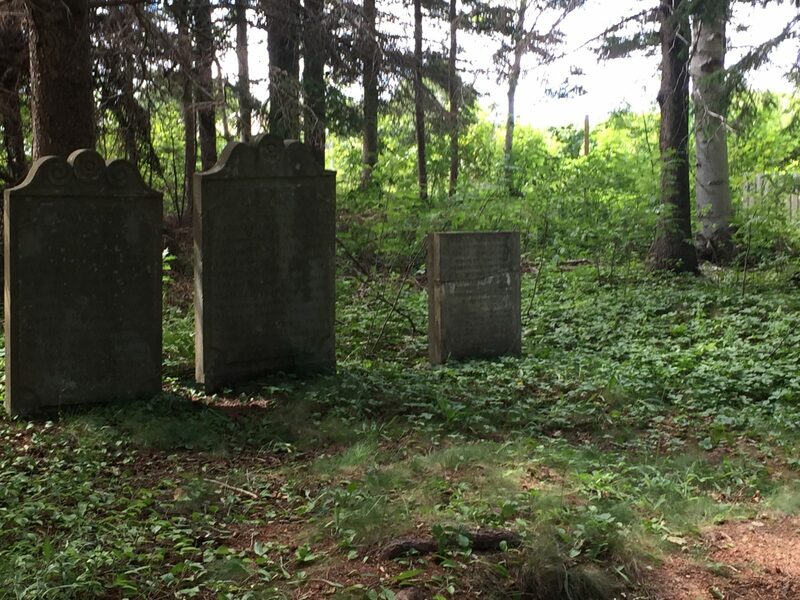 One of the quaintest and peaceful cemeteries I have ever visited was the Wightman Point Pioneer Cemetery. It is located on a point of land in Lower Montague, King’s County, PEI, just off the St. Andrew’s Point Day Park – across the bay from Panmure Island. 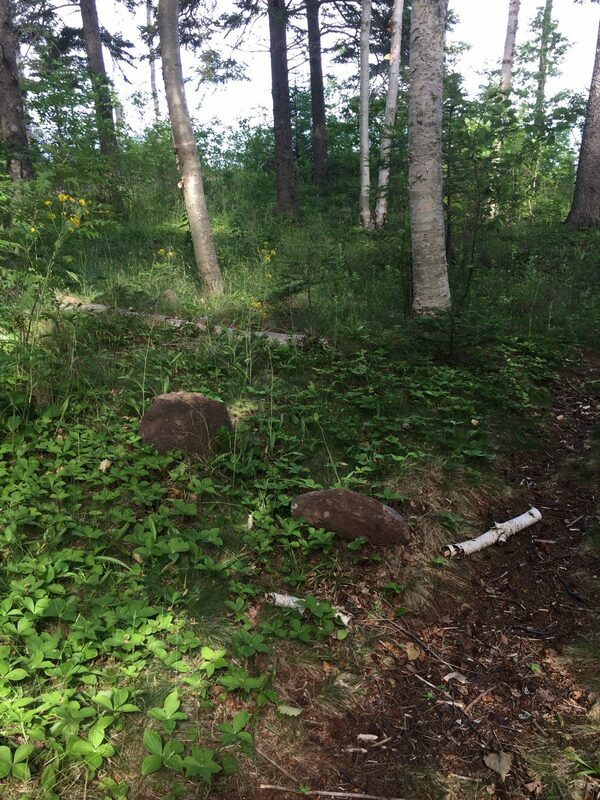 It has an entrance gate and is located near the shore in a treed area. 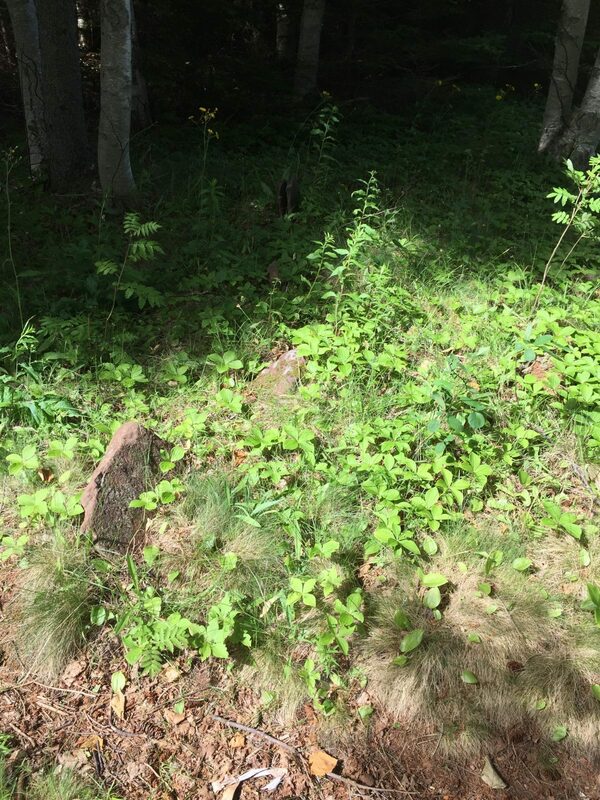 There are only five remaining headstones as well as several worn sandstone markers. The site has endured coastal erosion and a section of it has disappeared. 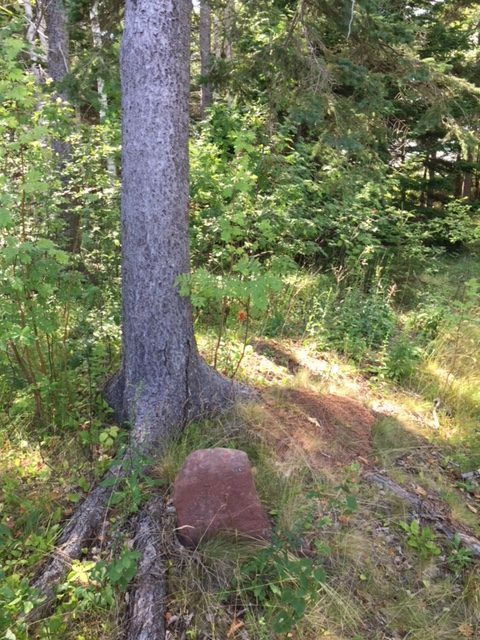 Many of the gravestone remnants were of a red sandstone and have become totally illegible over the past 200 years. In 1821, John Wightman and his wife, Margaret and their family emigrated from Hoddam in Dumfries, Scotland. Their son, the Hon. Joseph Wightman (1806-1887) would be a major business and political figure in the area, serving as High Sheriff of Kings County. 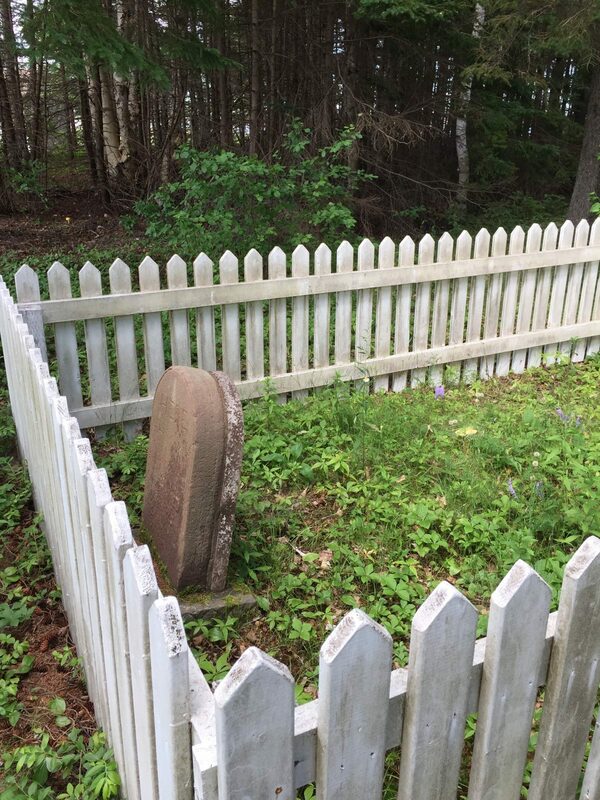 Two of his sons were killed in action in the American Civil War – one lies next to his grandparents, James Wightman. The Grave stone describes John as a Loving husband , a kind parent who leaves a wife, son and a daughter to mourn the sad loss of one esteemed by all who knew him. Margaret’s Grave stone describes her; “During her sojourn here she was exemplary in her charity to the poor and bore the character of a good Christian virtuous wife and loving mother and leaves her relatives to mourn their bereavement”. Graduated from Harvard Medical School in 1862. He was the assistant surgeon to the 2nd Massachusetts Infantry during the U.S. Civil War – part of the Union army – fought against slavery. 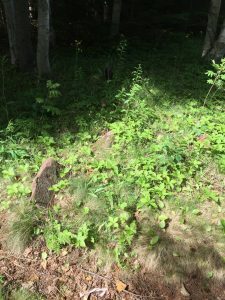 According to (The record of the Second Massachusetts Infantry, 1861-65) a faithful man, assistant surgeon to work himself to death in a few weeks. He contracted typhoid and died on June 16, 1863 in the Armoury Hospital in Washington, D.C. His remains were sent back to the Island. 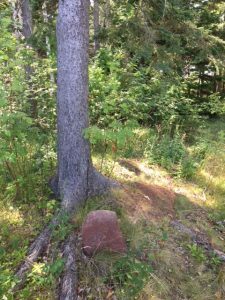 His father David was born in Scotland, moved to PEI in 1785 and received 200 acres of wilderness. He served in the Revolutionary War in New York. James, who was a Constable and a Three Rivers Farmer died September 1876. He. Among other crops he also grew 500 bushels of potatoes. He married Bridget O’Brien, a Catholic whom came from Ireland in 1809. He belonged to the Church of Scotland. So she converted to the Church of Scotland (Source: Steve Young), so they cold get married. The story of Job Creed, the son of William Creed and Elizabeth Prince, a direct descendent of William Brewster, the leader of the Mayflower Expedition; an Anglican who wanted to get married to Mary Thistle, a Catholic born in Ireland, much to his father’s dislike. His father, a wealthy man, threatened to cut off his son’s inheritance “without a shillin'” if he married a Catholic. That did not seem deter Job Creed, because he married her anyway and they lived very happily together and raised a large family. Job was a very talented man, he was a lay preacher in the English Church at Georgetown, and performed many funerals. 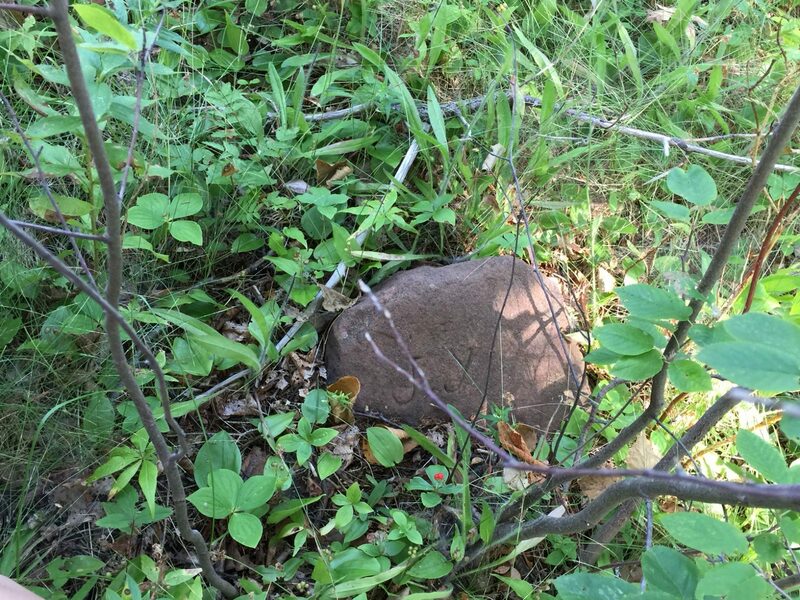 He is buried near his mother’s grave and it cannot be found today. 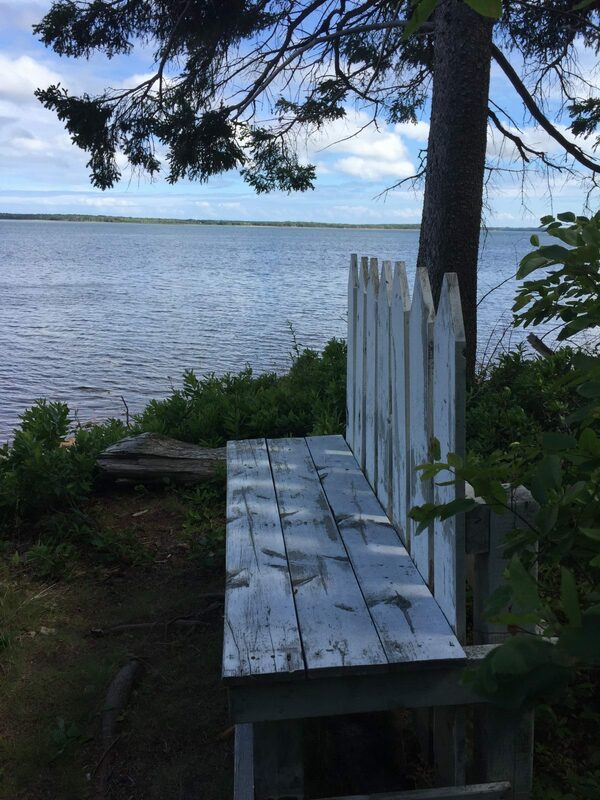 Mary is buried across the bay in the Panmure Island cemetery, and Job is buried in the cemetery at Wightmans Point. Since being of different religions, they could not be buried in the same cemetery. They requested to be facing each other in their different cemeteries., a bay separating them. 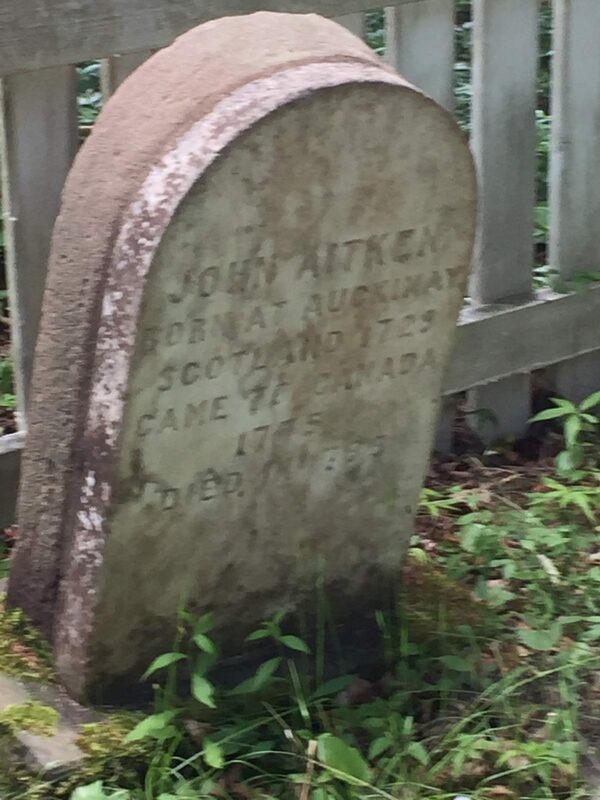 The earliest known grave in this cemetery is that of John Aitken (1729-1799). 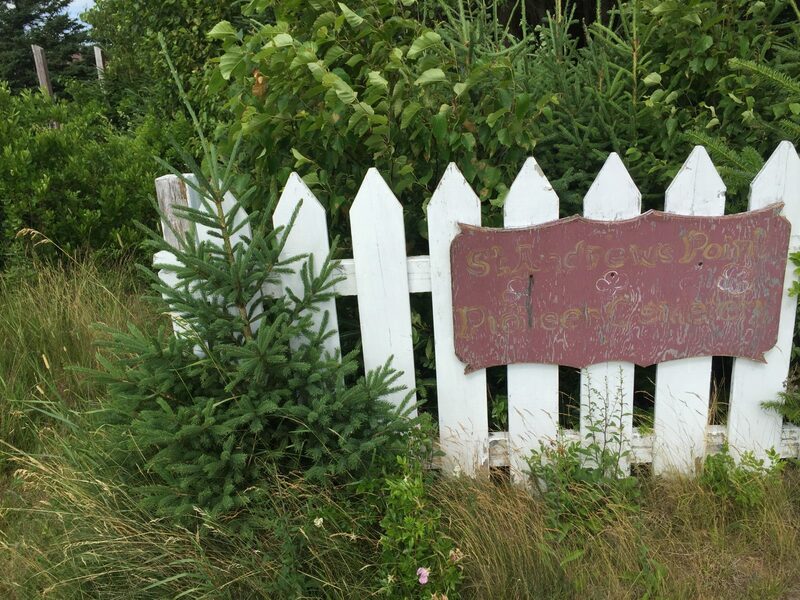 His stone is legible and enclosed by a fence. His name should really have been Job. 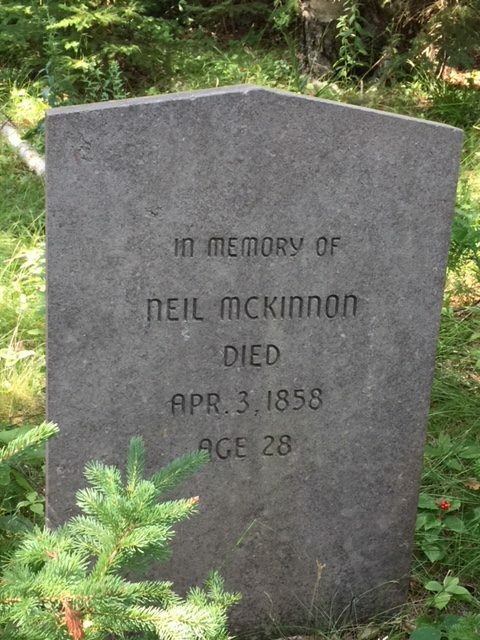 He came to Canada aboard the “Lovely Nelly” which departed Dumfries, Scotland in 1775. With him were his wife, Margaret (Lowden) Aitken and their two sons and two daughters. 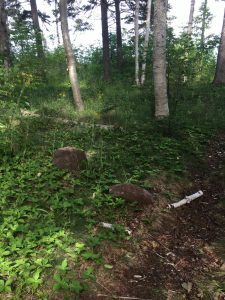 He was listed on the ship’s register as a “labourer” who was leaving “to provide for his family a better livelihood.” They decided to settle near Three Rivers, where John bought his first 100 acres. “He bought a quantity of supplies which would have seen them through the first winter . . . But in this year occurred an invasion of mice which destroyed everything in the houses as well as in the fields, even the potatoes planted in the ground.” (Wellwood Waugh). A second catastrophe followed in the fall of 1775. American fishermen broke into the building where Aiken’s supplies were kept and made off with everything. The ship that was to bring additional supplies was lost at sea and they were forced to dig through four feet of ice for clams to keep from starving. Since their cattle kept wondering off and getting lost in the woods, they then moved to Panmure Island (adjacent to Cardigan Bay) only to find that at low tide the cattle still strayed, so they eventually returned to their first location. His daughter Agnes died crossing the ice to Lower Montague and froze to death during a storm, coming home from visiting friends. She was the first to be buried in the Panmure Island cemetery. As a family history and genealogy enthusiast, I have limited resources. 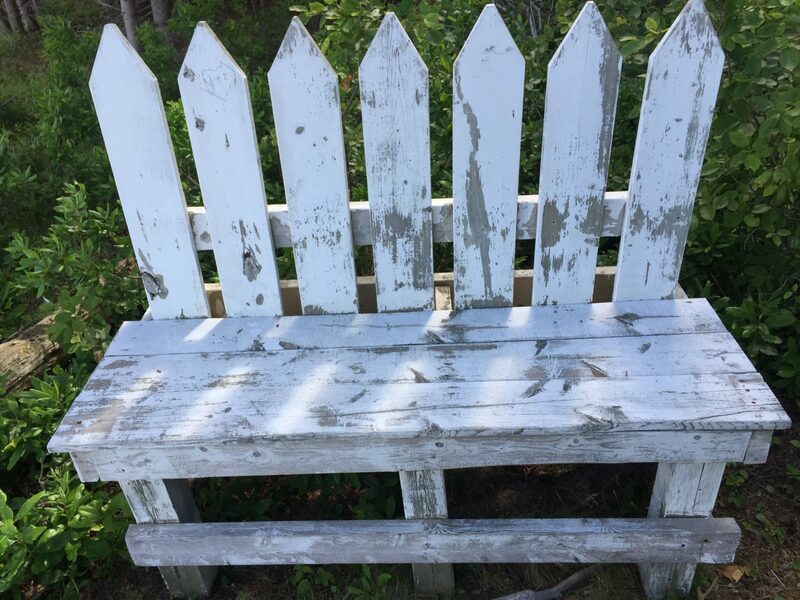 Most my family and my husbands family immigrated to Canada in the 1970’s and made a new home in Canada. Thanks to great online resources I am able to research my large family tree, and even find pictures sometimes. 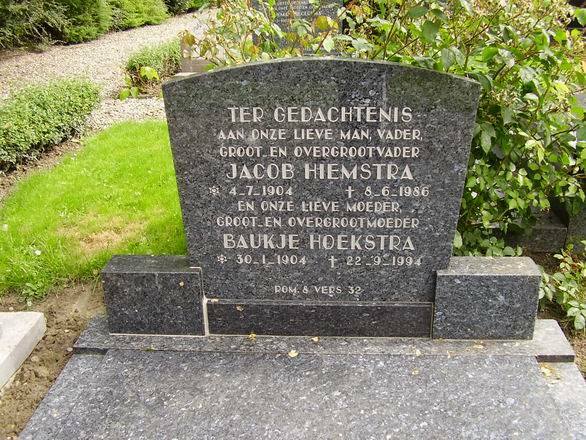 If I were to visit Holland, I would like to visit some of the cemeteries, but I am afraid a 2 week vacation would not be enough time, and would probably be spent with the living. Years ago I found Graftombe, an online resource for cemeteries in the Netherlands. 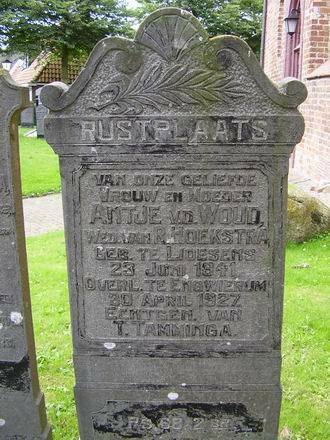 It has lots of information, as well you can request images of gravestones, and they will send them via e-mail, for free – it is in Dutch, did not find an English button.